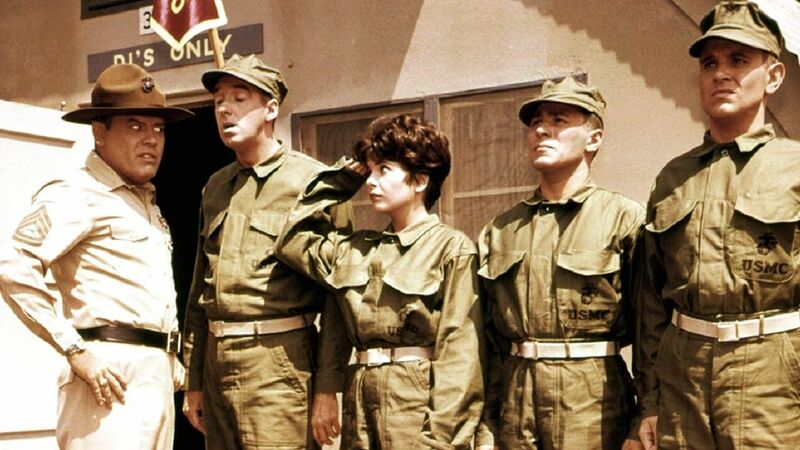 Here's where to watch every episode of Gomer Pyle, U.S.M.C. season 3. Mouseover or tap an episode to see where to stream it. Click or tap the play icon to stream it on the best available service. Lies, Lies, Lies Sep 14, 1966 Gomer tries to convince his friends that a movie star has invited them all to a barbecue at her house. Crazy Legs Gomer Sep 21, 1966 Carter plans to use Gomer to win the inter-squad competition. Gomer the Carrier Sep 28, 1966 Gomer and Carter are the only ones who don't come down with German measles. Caution: Low Overhead Oct 5, 1966 Sgt. Carter sets out to expose a fraud by proving to Gomer that the man who sold him a cheap watch is a crook. Show Me The Way to Go Home Oct 12, 1966 Gomer is accused by a drunk's wife of turning her husband into an alcoholic. How to Succeed in Farming Without Really Trying Oct 19, 1966 Carter sabotages Gomer's garden by putting vodka in his prize watermelon. Gomer and the Little Men From Outer Space Oct 26, 1966 Carter sends Gomer to a psychiatrist when he claims he has seen men from outer space. The Borrowed Car Nov 2, 1966 Gomer is arrested after wrecking Sgt. Carter's car. Gomer Pyle, Super Chef Nov 9, 1966 Carter bets Sgt. Hacker that he can't teach Gomer to cook a meal. Marry Me, Marry Me Nov 16, 1966 Gomer dates a girl with similar interests, then discovers that she considers them engaged after the first date. Cold Nose, Warm Heart Nov 23, 1966 Carter gives his girlfriend a puppy only to find himself competing with it for her affections. Follow That Car Nov 30, 1966 Gomer and Carter are captured by smugglers. It Takes Two to Tangle Dec 14, 1966 Sgt. Carter learns Bunny was seen with another man. Whither the Weather Dec 21, 1966 Gomer can predict the weather better than the weather bureau. Love's Old Sweet Song Dec 28, 1966 A songstress applauds Gomer's song with a kiss. Gomer the Recruiter Jan 4, 1967 Gomer unwittingly signs up a fugitive bank robber as a new recruit. The Secret Life of Gomer Pyle Jan 11, 1967 Carter suspects Gomer has been spending his Sundays at the beach; then tries to meet the beauties Gomer appeared with in a magazine. Go Blow Your Horn Jan 18, 1967 Carter tries to transfer Gomer to the Marine band. You Bet Your Won Ton Jan 25, 1967 Gomer holds a farewell dinner in a Chinese restaurant, not knowing it is a front for a gambling operation. Sue The Pants Off 'Em Feb 1, 1967 Two shyster lawyers try to get Gomer and Carter to file a false damage suit after a near miss from an automobile. Gomer the Card Shark Feb 8, 1967 Carter and Duke use Gomer to expose a card cheat. To Re-enlist or Not to Re-enlist Feb 15, 1967 Sgt. Carter attempts to keep Gomer from re-enlisting. Lou Ann Poovie Sings Again Feb 22, 1967 The Marine's favorite nightclub singer returns: Lou-Ann Poovie, who looks like a dream and sings like a nightmare. Sgt. Carter fights for her favors with two rivals -- Gomer and Duke. Gomer, the Welsh Rarebit Fiend Mar 1, 1967 Gomer's love for Welsh rarebit causes him to sleepwalk -- and to tell off Carter. Sing a Song of Papa Mar 8, 1967 A club owner wants Gomer to sing every night. Where There's a Will Mar 15, 1967 Carter volunteers Gomer for a parachute jump. Lost, the Colonel's Daughter Mar 22, 1967 Gomer loses the colonel's daughter at a go-go club, then tracks her to a beatnik den. The Crow Ganef Mar 29, 1967 Gomer's new friend, a crow, turns out to be a thief, plundering everyone -- and stashing the loot in Gomer's locker. One of Our Shells is Missing Apr 5, 1967 Carter and Gomer hunt for a live mortar shell which the private lost during practice. Lou Ann Poovie Sings No More Apr 12, 1967 When Lou-Ann is about to be fired from her job as a nightclub singer, Gomer finds her a job as a salesgirl.